The Grignard reagent as an organometallic reagent contains metal, i.e. magnesium is directly attached to the carbon of an organic molecule, and hence it can also be called an organomagnesium compound. 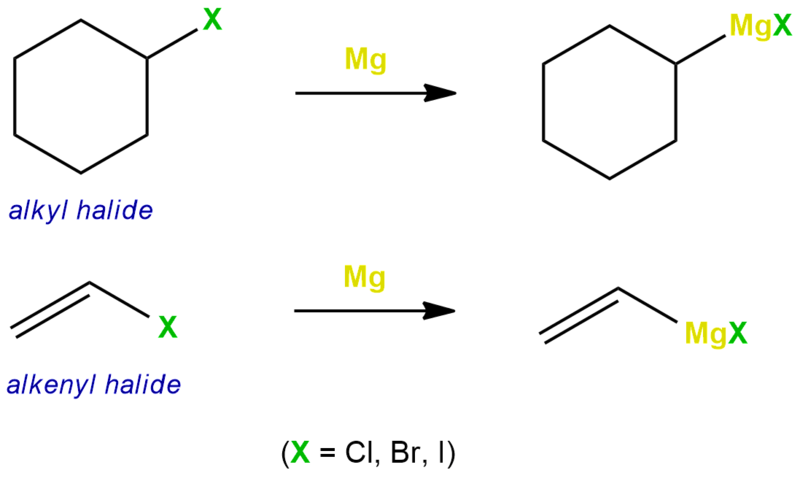 A Grignard reagent has a formula RMgX where X is a halide (bromides and iodides are common, with chlorides being seen as well, and fluorides are generally unreactive), and R is an alkyl, vinyl, or aryl group. The carbon-magnesium bond in a Grignard reagent is polar covalent with carbon being the negative end of the dipole, which explains its nucleophilicity. And the magnesium-halogen bond is largely ionic. 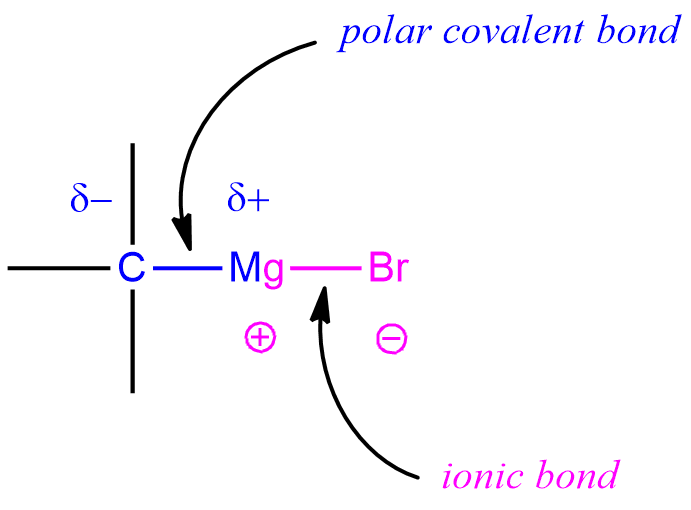 This ionic (Mg-X) bond benefits greatly from being effectively solvated. The formation of ions in very nonpolar solvents, where they would not be effectively solvated is very difficult. Ethers are surprisingly good at solvating cations, because the C-O bond is relatively polar, thus allowing the oxygen end of the ether dipole to solvate and stabilize (electrostatically) the magnesium ion. The carbon (bonded to magnesium) in these molecules tends to be electron-rich and thus have nucleophilic character, in contrast to functional groups such as alkyl halides, aldehydes, ketones, and epoxides where carbon has electrophilic character. And this is why special attention is paid to this compound. Grignard reagents are similar to organolithium reagents because both are strong nucleophiles that can form new carbon-carbon bonds. The Grignard reagent is prepared of alkyl or aryl halide and magnesium in the ether or tetrahydrofuran (THF) as a solvent. It cannot use a protic solvent, such as water or alcohol because the Grignard reagent will immediately grab a hydrogen from water or alcohol and deactivated itself. So the ether is used. The reagent is also destroyed in the air, therefore the reaction is carried out under nitrogen or argon atmospheres, using air-free techniques. 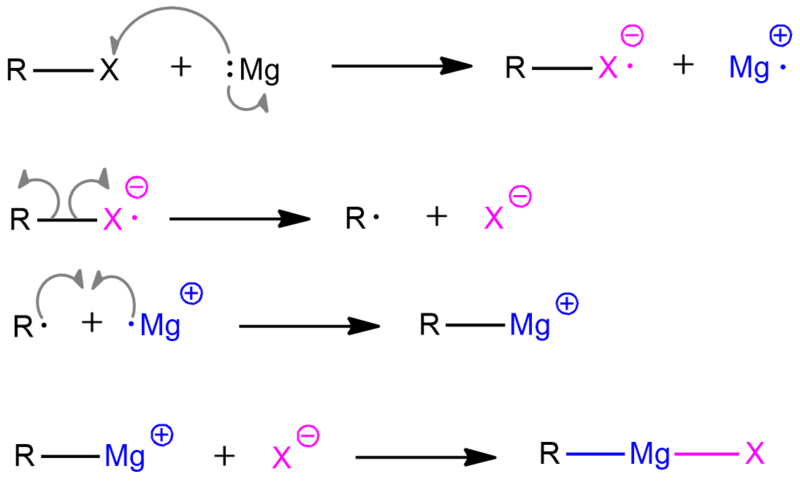 As you can see in the following reactions, magnesium is directly inserted into the carbon and halide. The mechanism for obtaining these compounds is generally shown in a simpler way, as herein in the reactions with alkyl and alkenyl halide. 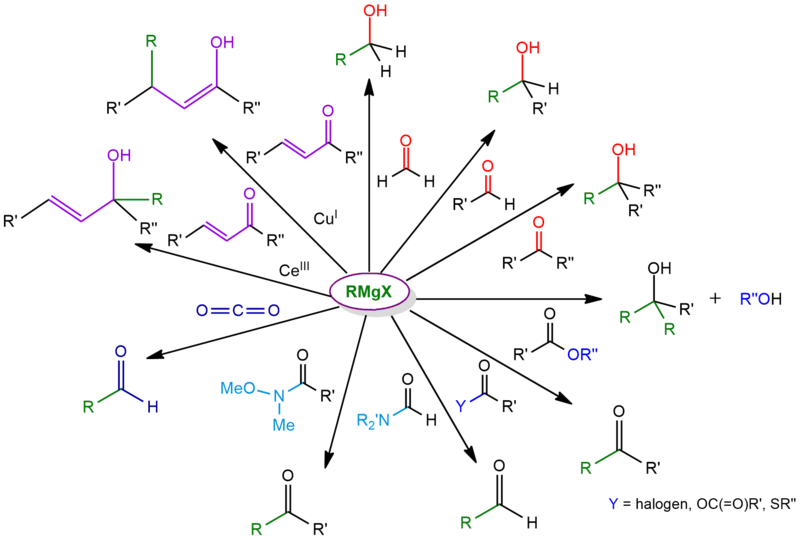 But this mechanism involves radical intermediates. There is one major difference, however. Grignard formation does not involve a radical chain mechanism. It is a non-chain radical reaction. 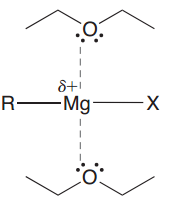 As already stated, Grignard reagents form via the reaction of an alkyl or aryl halide with magnesium metal. The reaction is conducted by adding the organic halide to a suspension of magnesium in an etherial solvent, which provides ligands required to stabilize the organomagnesium compound. Empirical evidence suggests that the reaction takes place on the surface of the metal. Magnesium is in the second column of the Periodic Table and therefore it has two valence electrons. It wants to get rid of these two electrons to get full octet. In this reaction, both of these electrons will not be released over immediately. Only one electron will be handed to halide, and other will remain on magnesium. This is the rate-determining step. Grignard reactions often start slowly. As is common for reactions involving solids and solution, initiation follows an induction period during which reactive magnesium becomes exposed to the organic reagents. After this induction period, the reactions can be highly exothermic. The next step is the homolytic cleavage of the negatively charged alkyl halide radical. One electron of this bond will fill the halide octet and give it a negative charge. An alkyl radical is also formed. Then, this alkyl radical and positively charged magnesium radical will connect their lone electrons and form a bond with a positive charge on magnesium. In the end, this cation and halide anion give the final product – Grignard reagent.